As mentioned last week KUMZING 2 was just released by Nigun Dist. 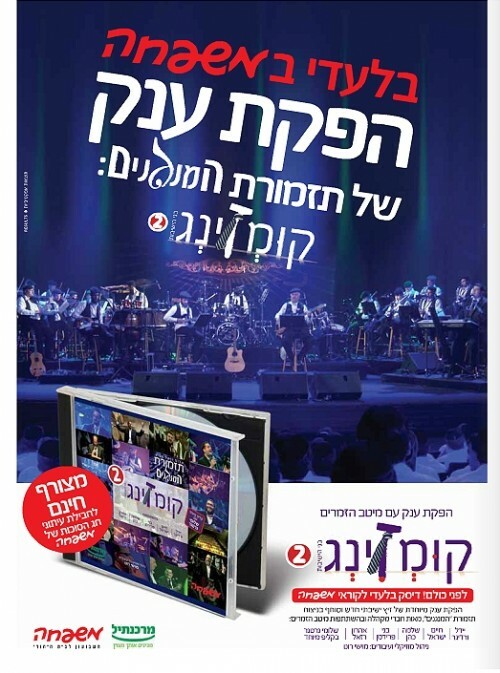 The double-CD includes the mega talented music of the HaMenagnim Orchestra and features the voices of Aaron Razel, Benny Friedman, Chaim Israel, Yeedleand Shloime Cohen with NEW up-to-date arrangements, written specially for that night for a 25 pieces band!. Not only are these world renown superstars singing their biggest hits but they also introduce you to BRAND NEW SONGS. KUMZING 2 was produced by the multi-talented Shalom Vagshal, and his talent really comes through in this project. Below you will find the audio preview for the Double-CD Kumzing 2. The sampler opens with over sever hundred bochurim who attended the event answering “Boruch Hasehm Ham’voiroch..” as the opening track is a brand NEW song called “Borchu” performed by Moshe Roth and composed at “Bnei Torah” camp of yeshivas Ateres Yisroel. The last set on Kumzing 2 is called “A Kumzing Tish“. The set features 25 minutes of the greatest & warmest shabbos song of all time, from all types of Jewish backgrounds: Hassidic, Ashkenazi, Sphardic, and even Carlebach. The Shabbos medley starts with a very unique ethnic version of the most famous “Ko Echsoif” of Karliner Rabbe ZT”L, when the audience starts singing they are accompanied by a special instrument called a “Kamancheh” (an Asian arab string instrument) as you can hear on the sampler. The “Kamancheh” adds a truly original oriental flavor to this holy chassidic song. Also featured in this set is a brand new song from Benny Friedman’s NEW album Yesh Tikva called “Shalom Aleichem“. The “A Kumzing Tish” set will NOT be featured on the FREE CD enclosed in the Succos edition of the Mishpacha. It will ONLY be featured on the Double-CD available in stores ONLY!. Two other surprises included on disk two are a BRAND NEW music video featuring Shloime Gertner and the HaMenagnim Orchestra in a NEW song entitled “Torah” AND the video preview/teaser for KUMZING 2 the DVD which will be released Chanukah time.